After several months of fastidious planning and attention to many logistical details, 275-plus enthusiastic nutrition professionals from across the country attended Today’s Dietitian’s first annual Spring Symposium at the Tropicana Las Vegas from May 18 to 20. According to many attendees, the symposium was an extraordinary event and a huge success. They said everything it offered them professionally and educationally was invaluable. The Nevada Dietetic Association (NDA) and Today’s Dietitian worked in tandem during the symposium. The NDA held its annual meeting and awards ceremony plus its student poster session, which it made available to conference attendees. Nineteen poster presenters from the University of Nevada, Las Vegas (UNLV) discussed their research on topics such as COPD, burns, refeeding syndrome, HIV/AIDS, celiac disease, and dietary guidance for Roux-en-Y gastric bypass patients. Moreover, an enthusiastic team of student volunteers from the dietetics programs at UNLV; the University of Nevada, Reno; and Truckee Meadows Community College in Reno, helped symposium attendees navigate their way through the conference center, oversaw the Q&A segments of the continuing education sessions, answered questions about the event, and packed tote bags with programs, product samples, and other important information. Daniel Lingle, a dietetics student at Truckee Meadows Community College, said he especially liked the diversity of specialties among the attending nutrition professionals. “I enjoyed listening to the various presentations about public relations, social media, and geriatrics. They were highly informative and inspiring,” he said. Today’s Dietitian had an incredible experience working with the university students and the NDA. The symposium afforded chapter members networking opportunities with peers from around the country and gave attendees a chance to learn about Las Vegas and its local dietetics chapter. To kick off the symposium in grand style, Today’s Dietitian hosted a two-hour poolside welcome reception, a preshow party and networking opportunity for attendees, in the Tropicana’s Beach Club, where everyone enjoyed soft drinks, cocktails, and tasty hot and cold hors d’oeuvres, crudité, and desserts. There was so much food, laughter, and good conversation that one attendee cancelled her dinner reservations she’d made previously because she didn’t realize there was going to be so much food and great company. “It was well organized, a good turnout, and the food was good!” said Sanam Shahrokhinia, MS, RD, a clinical dietitian at Cedars-Sinai Medical Center in Los Angeles. The next morning, attendees were greeted with nutritious Kellogg’s breakfast cereals, fresh fruit, yogurt, coffee, tea, and juice along with hilarious keynote speaker Brad Nieder, MD, known as “The Healthy Humorist,” who blends health care humor with wellness advice. With many funny one-liners and amusing stories, Nieder, who gave up emergency medicine to become a comedian, explained how laughter really is good medicine for managing pain, boosting the immune system, and relieving stress. So to all the nutrition professionals out there, remember to smile and laugh for a healthier, happier present and future. • Dana Angelo White, MS, RD, ATC, an assistant clinical faculty member and sports dietitian at Quinnipiac University in Hamden, Connecticut. “The symposium was so well organized and well managed timewise [in addition to] the room arrangement, temperature, nutritious meals and, most of all, well-chosen and brilliant speakers,” added Rose Quirante, MS, RD, LD, a renal dietitian at the Renal Center of Port Arthur in Texas. During the morning and afternoon breaks, attendees enjoyed the book and product showcase where they could meet some of the session speakers who were authors to discuss and purchase their latest books. Brown-Riggs, author of the African American Guide to Living Well With Diabetes; Palmer, author of The Plant-Powered Diet; Weisenberger, author of Diabetes Weight Loss—Week by Week; and Dorner, author of the Diet and Nutrition Care Manual, Policy & Procedure Manual, and various other continuing education resources, autographed books and other materials for purchasers. Today’s Dietitian’s sponsor companies—Almased, Daisy Brand Cottage Cheese, Diabetes Sentry, Go Veggie!, INBalance Health Corp, Kellogg Company, and Walden Farms—discussed their newest products and provided samples for attendees to taste and eventually tout to clients and patients. Daisy Brand Cottage Cheese provided mixed berry parfaits for the Tuesday morning break. The lunch offerings also were a huge hit with attendees. “I was very happy that healthy food was served, especially the vegetarian lunch,” said Kristine Duncan, MS, RDN, CDE, an adjunct nutrition instructor at Skagit Valley College in Mount Vernon, Washington. On the second day of the symposium, a Tuscan buffet lunch was composed of sausage kale soup, Caesar salad, caprese salad, grilled vegetables, and a variety of pasta dishes. Fresh fruit, tiramisu, and cannolis graced the dessert table. “From day one, the foods and snacks conveyed the message that you can eat healthfully no matter where you’re at,” said Avelina San Juan-Roberto, MS, RDN, LD, who practices in Henderson, Nevada. Of course, the symposium didn’t include all work and no time for meditation and relaxation. On the second day, attendees were invited to an invigorating yoga session led by Las Vegas yogini Angie Negrete-Markle in the hotel’s outdoor Wedding Chapel courtyard. Participants engaged in a tranquil workout amid the sweet scent of fresh flowers and soothing sounds of a waterfall. Afterward, they were encouraged to eat a quick grab-and-go, healthful breakfast that included Special K products, apples, and bananas. “I appreciated the variety of session topics that were offered, which enabled me to carefully select those sessions that were of the most benefit to me personally and professionally,” said Jenny Favret, MS, RD, LDN, an eating disorder specialist for the Duke Healthy Lifestyles Program at Duke Children’s Hospital & Health Center in Durham, North Carolina. Next year’s symposium currently is in the planning stages. Much like the first symposium, it will include a stellar lineup of top-tier presenters and even greater opportunities to network and participate in continuing education sessions. We look forward to seeing you next year! 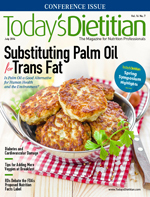 — Judith Riddle is editor of Today’s Dietitian.